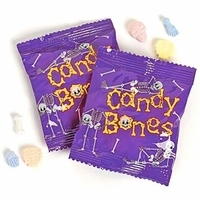 These skeleton candy bones treat packs will delight your trick or treaters . Tart and tangy candy bones when you put together you can make your own skeleton. Each bag has 18 individual treat size snack packs.